I’m starting to lose track of how many times we’ve been in and out of Goderich. Like a boomerang that has been flung into the air, the winds and trajectory return us to this charming little Ontario city. If you read our last post, you know that Liz Gozzard pretty much chased us off the dock. With Mike Gozzard acting as our weather forecaster, we set off from Goderich on July 26 with renewed confidence. The major boat issues were addressed and we would spend the rest of the summer enjoying the cruising lifestyle. July 26 Need a lee cloth for the books! The winds were projected to be from the south/southeast at 10-12 knots. A nice beautiful day for motor sailing on a beam reach across Lake Huron to Port Austin, which is at the tip of the thumb of the so-called mitt of Michigan. With sails raised and smiles on our faces we happily chugged along expecting to reach our destination by mid-afternoon. Alas, the bliss was short lived. The winds must have missed the weather forecast. By 11:30am they had clocked around to the southwest and increased to 20 knots. The predicted wave height of 3 feet quickly built to churning, confused seas of 6 feet or more. With the skies darkening to the west we doused sails amidst thrashing waves and adjusted our course. 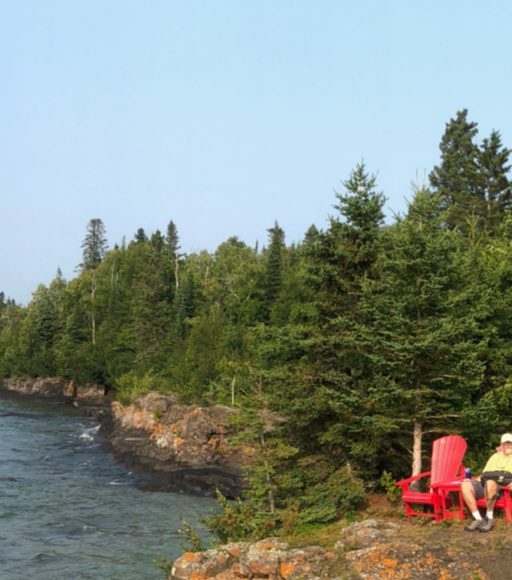 We opted for a more southerly heading and made for the nearest harbor of refuge, Harbor Beach, MI–just 18 nautical miles away. In a little over 3 hours we arrived at the Harbor Beach marina in an absolute downpour. The marina staff was quite happy when we indicated we could dock in the well-protected harbor without their assistance. The next morning, we awoke to the sound of power boats and 18 jet skis jockeying for position at the fuel dock, just down the pier from our slip. Harbor Beach was one of the scheduled fueling and rest stops for a pack of Detroit-area devotees of jet skis called the Water Warriors. 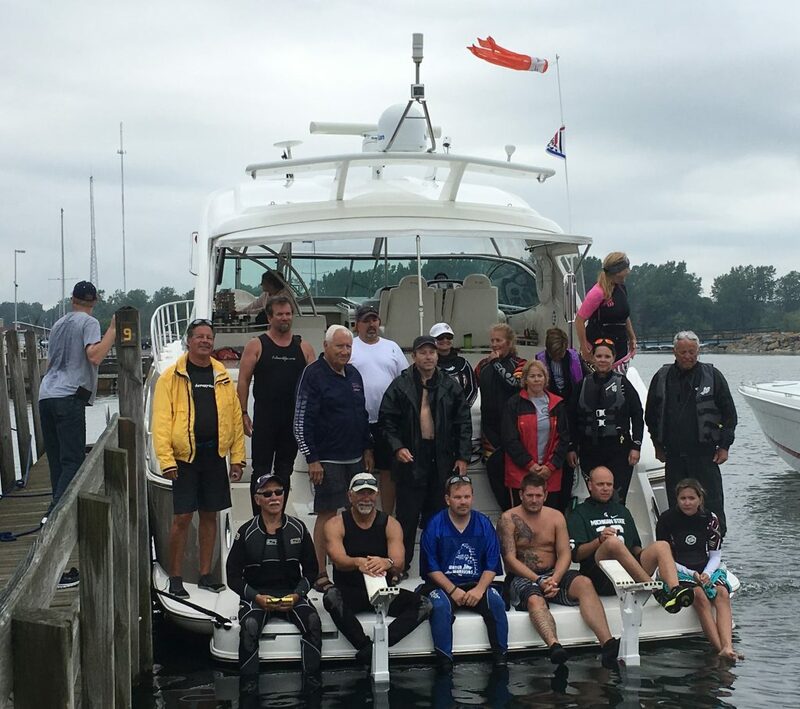 The Water Warriors support the Special Olympics with an annual fundraising run from Mackinac to Lake St Clair. That’s a total of 450 miles on jet skis. Each participant pays his or her own expenses on the trip and commits to raising at least $1500 in contributions for the Michigan Special Olympics program. With cars following on land to provide food, changes of clothes and other material support, four very large power boats escorted the fleet of jet skiers. Most of the water toys carry an additional passenger: a favorite stuffed animal from one of the children they support. 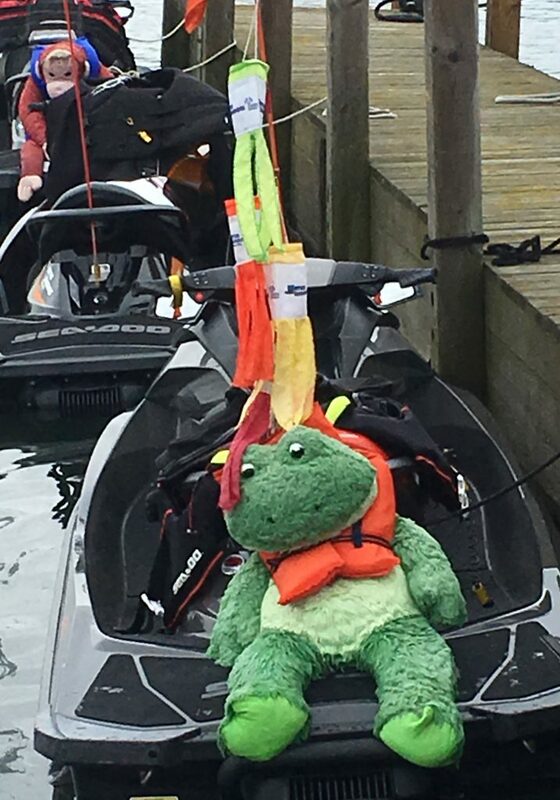 Like the Warriors themselves, the stuffed animals all sported life jackets. Many of the fuzzy avatars’ PFDs were decorated to coordinate with their drivers’ gear. It was quite entertaining and opened a door in our minds that there just might be some redeeming qualities to people who ride those all-too-often annoying personal watercraft. As quickly as they arrived, the Water Warriors departed, headed south and sounding like an angry swarm of bees. We cast off at a far more leisurely pace and headed north with a target of Port Austin, which is further up and around the top of the Michigan thumb from Harbor Beach. Our course to Port Austin put the wind dead on our nose most of the way. We adjusted course and put the staysail out to give us a little extra push as we motor sailed along. Halfway to Port Austin the skies cleared to a beautiful sunny day. As we approached the first waypoint that would head us to a more westerly direction across the top of the thumb, we decided to keep going due north to Harrisville, MI. 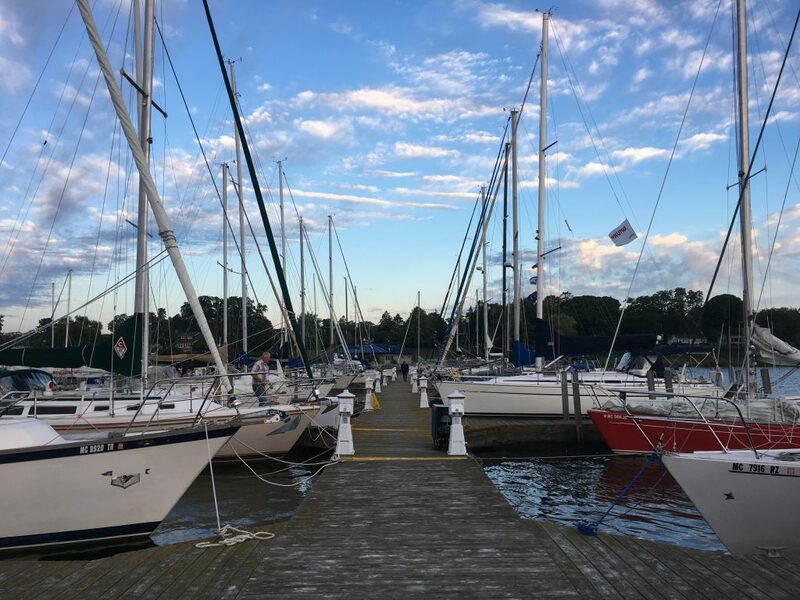 Harrisville was 30-some nautical miles across Saginaw Bay. And this is why we never write our destination in our ship’s log until we actually stop for the day – we change our minds too often! Heading to Harrisville doubled our distance for the day (62 nautical miles) and we knew we would be arriving well after closing time for the marina. To our surprise, when I called they indicated they would be open well after our targeted arrival of 8:00pm. Now some marinas may stay open till 7 or 8pm on the weekends but I’ve never heard of a marina staying open that late on a Thursday. As an extra bonus, we began encountering sailboats heading south; most were flying their brightly colored spinnakers as they ran downwind. Most of the boats were a mile or more east of our course and further out into Lake Huron. The colorful spectacle of these sails was a pleasant diversion as we cruised out of sight of land for several hours. 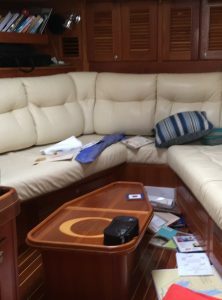 We are quite familiar with the Harrisville Marina as we were caught there for four days last fall due to heavy eastern winds during our delivery of a Gozzard 44 from Traverse City, MI to Goderich. We were expecting the semi-empty, quiet marina we had experienced before. Not so! As we headed into the harbor entrance another sailboat tried to cut us off and yet another was right behind. The marina itself was packed with sleek race boats and lots of revelry. Even though it was a sailing crowd, we didn’t really fit in. 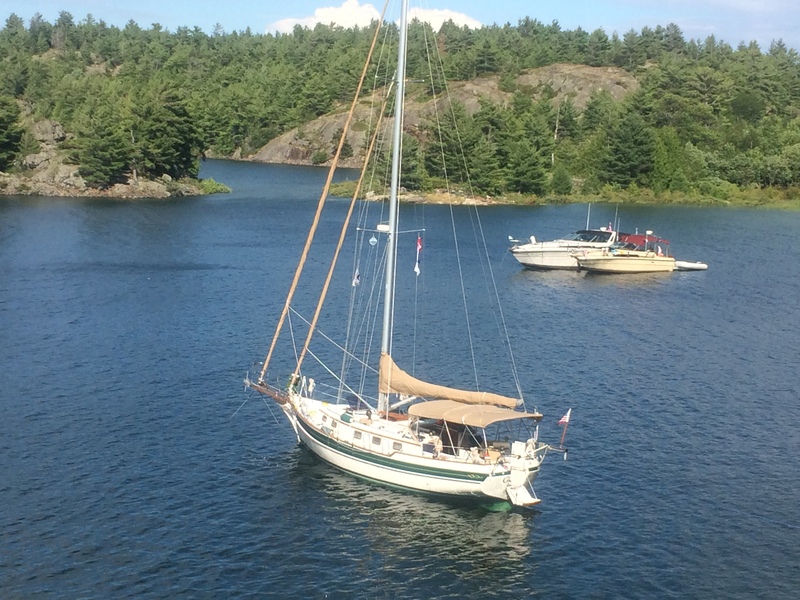 This was made evident as the noise and chatter dropped considerably while we navigated Gaviidae into an inner slip with her menacing bowsprit threatening to impale any one of the race boats along her path. In fact, Dan overheard one sailor sneer to another who had just made an admiring comment about Gaviidae, “Some people care more about how their boat looks than how it performs.” Dan shrugged off the slight to snobbish disdain for non-racing sailors, a moronic lack of appreciation for sailboat aesthetics and profound ignorance about the performance priorities and capabilities of a Gozzard 41. 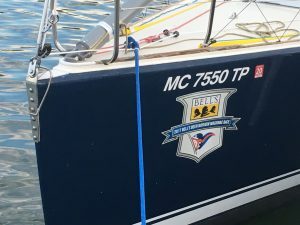 Once secure, we learned from the marina office that the race boats were returning to their home ports from Mackinac Island where they had participated in the Bell’s Beer Bayview Mackinac race. 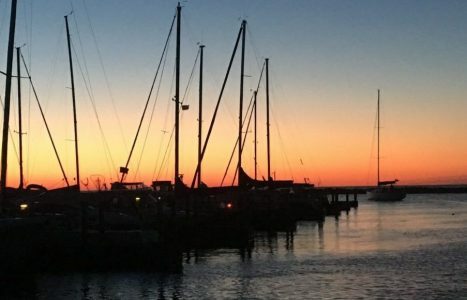 The marina stayed open till 11pm to ensure that all of the race boats had a safe harbor for the night. Now that’s service! We joined the early risers (this is unusual for us!) on Saturday morning and headed north targeting either Presque Isle, MI or Meldrum Bay, at the west end of Manitoulin Island in Ontario. With another beautiful clear day in our favor we charted for Canada and cruised into the exquisitely beautiful North Channel. So how does this boomerang land us back in Goderich? Well that’s for another day! Looking forward to the continuation of your journaling. 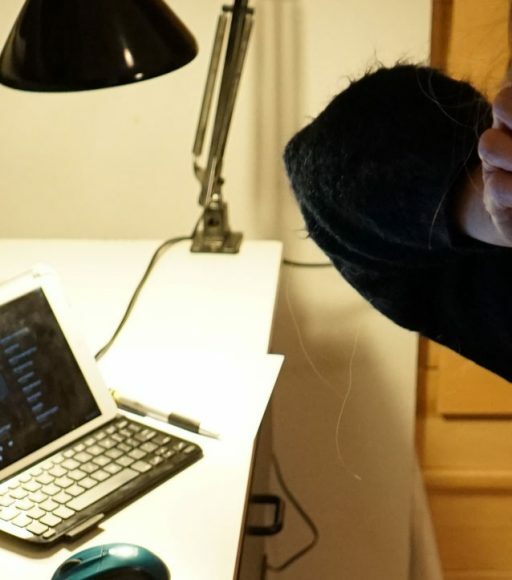 You must have taken great notes to remember these details in October. Hope you are well. Fall is coming. Leaves falling. Harvesting garden. Cutting down plants. Found a neighbor boy who is interested in working. Sure goes faster with help. Lots of hugs. Pictures help bring the memories back!